First I must offer apologies, dear readers, as I was slammed the past three or so weeks and have not been keeping up my side of the blogging bargain. But I am now back: tanned, rested and ready to resume providing content for all your aviation blogging needs. My absence consisted of preparing for my annual check ride, several trips out to Cali for a concert and to assist a charitable work group associated with our old church, and several trips to Colorado Springs. 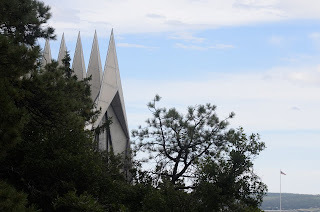 These last trips were for both wifey's college reunion, and to visit the whelps, both of whom are currently matriculated at the Air Force Academy, affectionately known and hereafter referred to as the Zoo. Why is the school known as the Zoo? Well, a central area known as the terrazzo or "T-zo" where the cadet wing forms up can be viewed by visitors from an elevated area adjacent to the chapel. A civilian school might call this area a "quad". Lore has it that the cadets felt as if they were animals in a zoo while being looked down upon over the fence. Graduates of the school are known as "Zoomies", an appellation which dovetails nicely with a lyric from the Air Force Song: "Here they come, zooming to meet our thunder..."
I always enjoy my trips back to the Zoo. I didn't go there myself, but as a spouse and parent of three Zoomies, there have been quite a few trips up to "the Hill" over the years. And as it turns out, I know nearly as many classmates at my wife's reunions as she does. You see, we met as instructor pilots at Williams AFB in the mid-80s. The practice back then was to send a huge chunk of newly graduated 2nd lieutenants from the Zoo to the same pilot training base. A good selection of those pilots would, upon graduation from pilot training, be returned as instructors themselves. Wifey was among this group along with many of her classmates from the Zoo. So we had our cadets with us talking to old friends with whom we had instructed aspiring pilot candidates in the venerable T-37. My kid's eyes bulged as they realized that a few of our old pals had stayed in and had made general rank. In fact, at 30 years, only the Generals were left on active duty as all others had to retire by then per regulation. Now as I said, I didn't go to the Zoo but am always prepared to handle the inevitable questions about what inferior school I did attend when at these events. My usual schtick is to state that no, I didn't go to the Academy, but rather to college. And then since my commissioning source was OTS which means I was a "90 day wonder", I'll say that it only took me only 90 days to learn what it took the Zoomies four years. This had one of the guys visibly upset but it's only a joke as I have the utmost respect for anyone that graduated from the Academy. I doubt that I would have made it through. I was older and had just returned from an overseas assignment, but was thrown in with this group of fresh faced pilots as their supervisor. For many of them, I was their first boss. So as a captain at age 26, I was more or less in loco parentis for a dozen or so 23 year old lieutenants. You might imagine that this situation had the potential for some less than optimal outcomes, at least from a military decorum and order point of view, and of course you'd be correct. It was just a short while later after I'd been given the job of Flight Commander that one of my lieutenants announced that he was engaged to be married. My thought was that since my party was such a success, why not a reprise for one of my guys. So that's what we did. Only we were going to take it up a notch...or two. I planned the entire event. We rented an RV, put a keg of beer in the shower and drafted a guy in the flight who didn't drink to drive the rig. On the appointed day we collected about a dozen guys and the bachelor, whom I'll just refer to as 'R'. After collecting our merry band of yahoos, we started off for the west side of town to the storied Great Alaskan Bush Company or ABC. Following lots of drinking, puerile hi-jinks and general mayhem, we decided to relocate the party back to one of the guys' houses. In an effort to be the consummate bachelor party host and attentive boss, I had also taken care to arrange for some additional entertainment to be provided by a young lady practiced in the art of exotic dance. We had a schedule to keep. It was on the drive back that events accelerated. "R" being somewhat small in stature and having been fed ample amounts of liquor, started to wobble a bit. Meanwhile, another associate, we'll call him 'J' , had followed us in his newish BMW. It seemed a bit odd to me that he didn't want to ride in the RV, but looking back on it after all these years it made perfect sense. Plausible deniability has its uses. Well, at some point, one of the more adventurous RV riders, we'll call him 'C', thought it might be a good idea to exit the RV and to climb up on the roof for some "urban surfing" while cruising down the freeway. Even in our inebriated state, the rest of us knew that this was an extremely bad idea and he was pulled back inside. Meanwhile, J pulled up alongside the ship of fools only to have his Beemer splashed with the contents of R's belly as he stuck his head out the RV and hurled. This development had the ship's complement in stitches, but the best was yet to come. After arrival back at the house, the 'entertainment' arrived and started her show. R had been stripped to his skivvies and was getting a lapdance when who should decide to crash the party? You guessed it, R's fiance and a few friends. They marched in, surveyed the scene, and then without a word turned and marched out. All I could think was that R would thank us in the morning. There are plenty more girls out there after all. I spent the next day hosing down and deodorizing the RV. Let's hear it for PineSol! Well, no one knew it, but we had not one, but two future Air Force Generals in our soiree that night. R went on to fly a fighter and retired as a General. And he's still married to the same girl though she never spoke to me again. J, the guy in the soiled BMW, also went on to fly fighters and make General though he'll no doubt deny any and all association with this event. C, the urban surfer, now flies for American Airlines.